This post is sponsored by Black Creek but the content and opinions expressed here are my own. 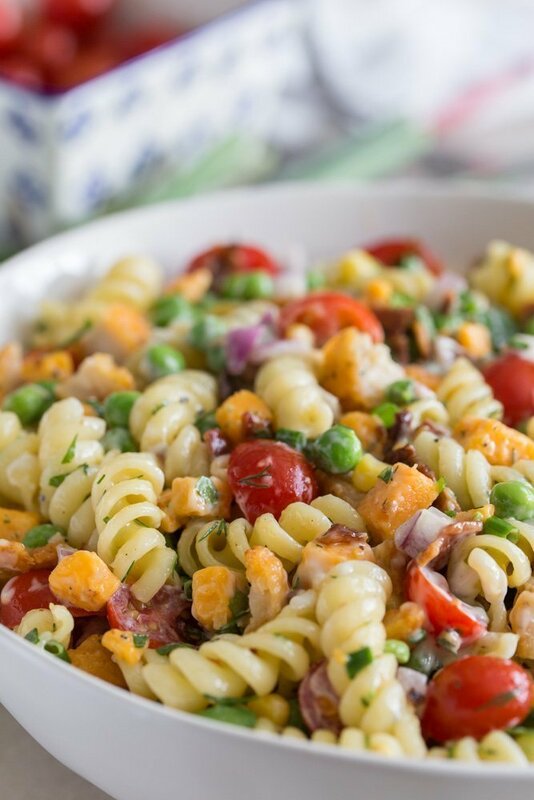 Pasta salads are one of the easiest side dishes to make. 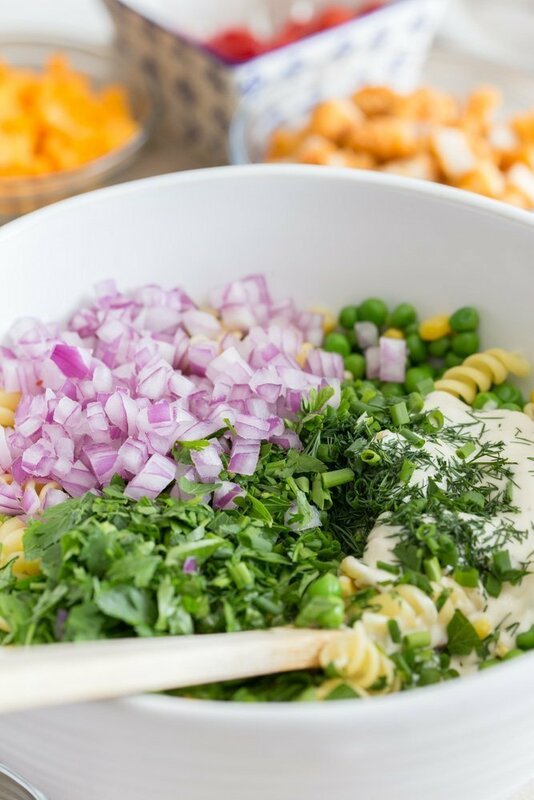 A cookout just isn’t a cookout unless you have a big bowl of veggie filled pasta salad. 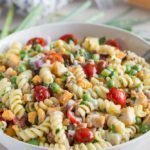 My Loaded Fried Chicken Pasta Salad is the ultimate side dish with it’s mashup of crispy chicken and pasta goodness. 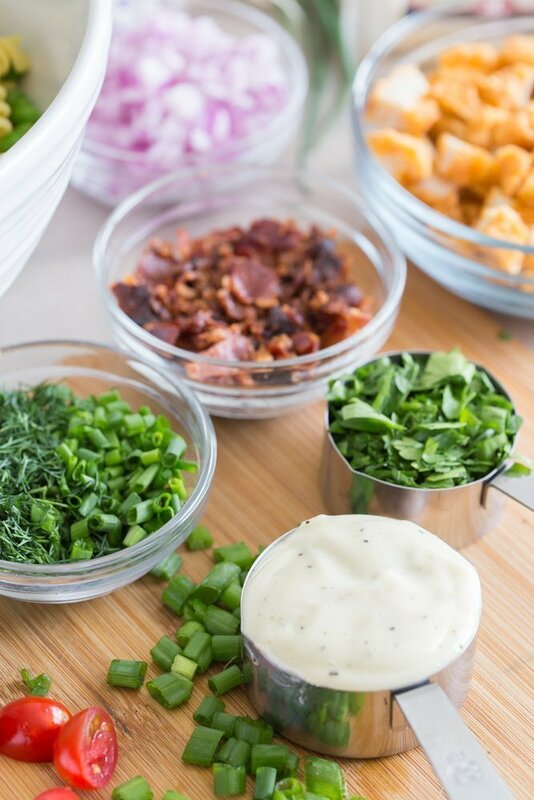 Fresh vegetables and chopped herbs balance perfectly with my Creamy Roasted Garlic Dressing. Alongside crispy bacon and pieces of sharp cheddar cheese of course! 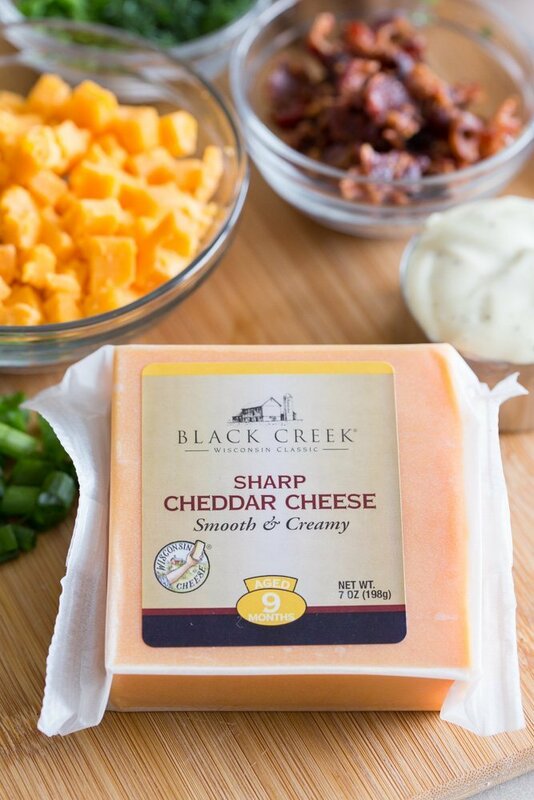 Black Creek® Sharp Cheddar (Aged 9 months) adds just the right amount of smooth nuttiness. Cultivated in the nutrient-rich pastureland of Wisconsin’s Fox River Valley. Award-winning Black Creek® premium Cheddar cheese is made from the creamy milk produced by the regions cows. Certified Master Cheesemakers develop that creaminess into smooth, full-flavored Cheddar cheeses aged up to three years. 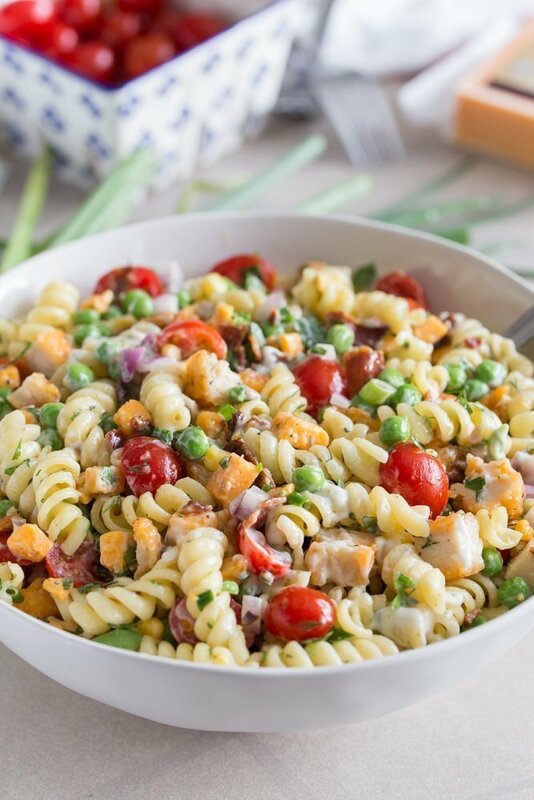 Bites of crispy breaded chicken is what really make this Loaded Fried Chicken Pasta Salad standout though. It is all of my favorite parts of a classic southern picnic, including cold fried chicken, mixed together. Granted I totally cheated with cooked chicken tenders from the deli department. There is no shame in using a few delicious shortcuts on occasion! 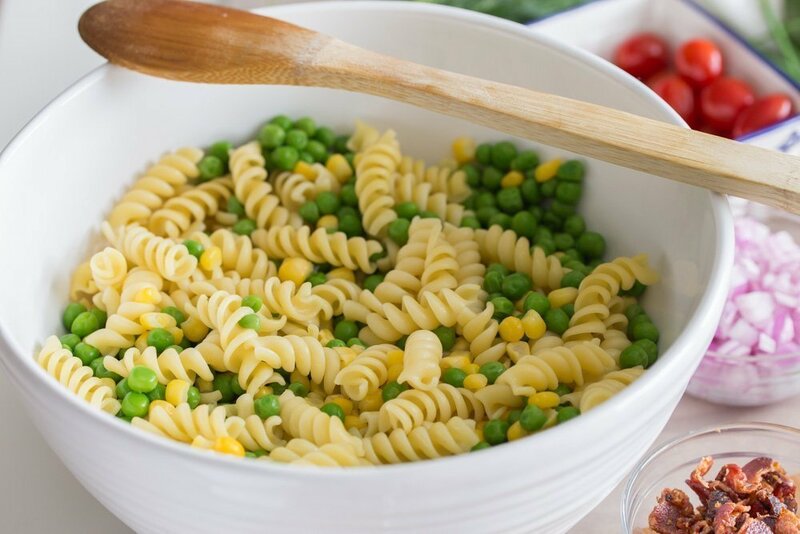 Frozen vegetables are another great addition to pasta salads. An easy to tip to thaw the vegetables is to place them in a colander. Then drain the pasta in the same colander. The boiling water will thaw your vegetables, plus it keeps the pasta from sticking together! 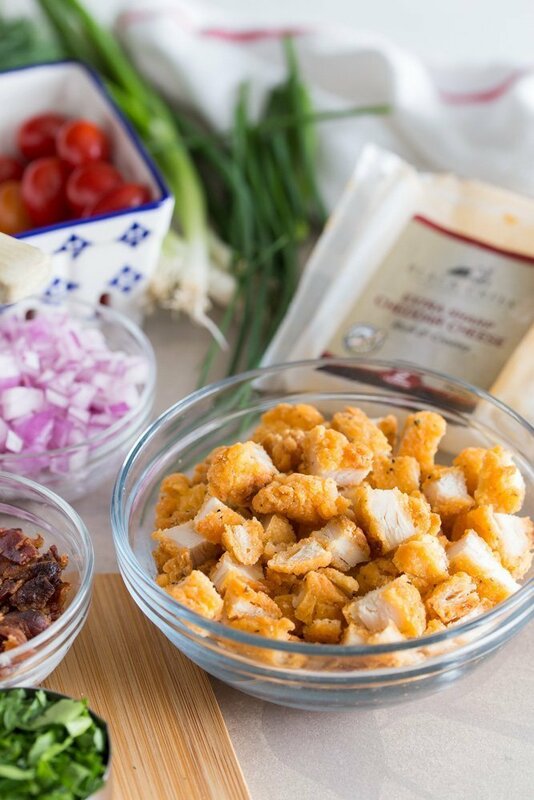 Visit the Black Creek® website for more tasty recipes and beverage pairings! I hope you like this Loaded Fried Chicken Pasta Salad as much as my crew does. If you love this delicious cookout inspired recipe, you can find more like it by checking out my Salad section. For recipe inspiration delivered to your inbox, subscribe to my newsletter, follow my photography journey on Instagram, and for generally inappropriate humor follow like me on Facebook! Prepared pasta according to package directions in salted boiling water. Drain, mix in thawed peas and corn. Set aside. While pasta cooks preheat a medium skillet over medium low heat. Cook bacon until crispy, 6-7 minutes. Drain on a paper towel lines plate. Crumble and add to pasta. Mix remaining ingredients except chicken into pasta salad. Pour in dressing, stir to coat completely. Add more dressing if desired. Chill at least one hour before serving. Can be made up to a day ahead. Mix in chicken right before serving. Toss to coat completely. Store leftovers in an airtight container in the refrigerator. 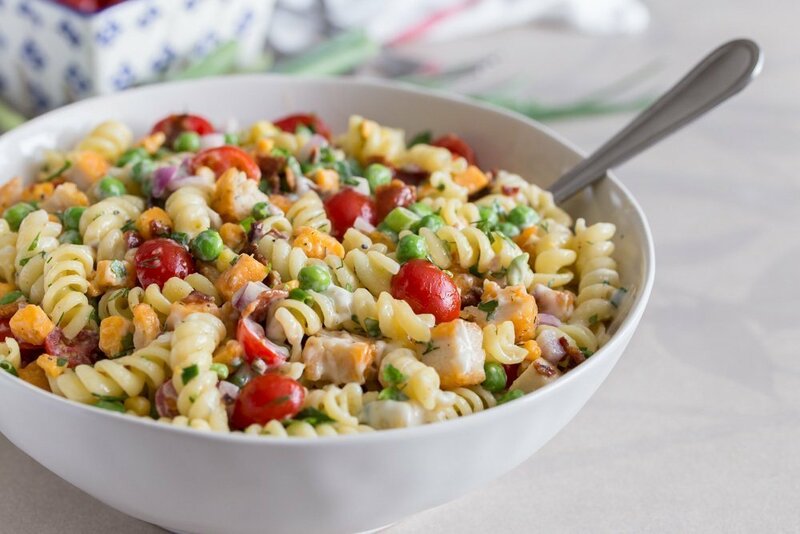 Tip - An easy to way to thaw frozen vegetables for this Loaded Fried Chicken Pasta Salad is to place them in a colander. Then drain the pasta in the same colander. The boiling water will thaw your vegetables, plus it keeps the pasta from sticking together! This looks perfect for summer dinners!